Steam showers are not a new concept. They have been used for thousands of years by Ancient Romans, Native Americans and various other cultures for their cleansing, healing, rejuvenating and soothing benefits. However, it has only been in the last few years, that installing a steam shower in one's home has become a viable option and an increasingly popular design idea. 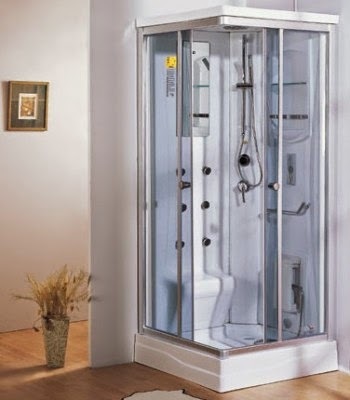 Basically, a steam shower is a steam room that provides you with the usual features of a bathroom shower. It unites the capability of a standard steam room with lots of extra features including a shower. When you consider the benefits of a steam shower combined with the convenience of having such a special feature in your home, you will probably want to immediately find more information on how to incorporate one in your master bath design. From a physical standpoint, steam showers are an ideal way to remove toxins and dirt from your skin. Steam showers also have health benefits such as clearing the sinuses to make breathing easier, easing bronchitis and increasing blood circulation. One of the benefits almost anyone can appreciate is the relief a steam shower provides for sore, aching muscles. In addition to its pain-relieving benefits, steam showers are revered as a means of reducing stress. The time spent in a steam shower can provide a renewal of energy and rejuvenate your body. Steam showers are available with a variety of special features such as mood lighting, body sprays, aromatherapy, bench seating, music and various other special features. Having the opportunity to cleanse your body, clear your mind and enjoy the many benefits of a steam shower without having to leave home can be considered one of life's ultimate conveniences. Interesting post, Lina. My husband enjoys using a sauna when he is able to find one at a resort. He feels the steam makes his body sweat away toxins.